The Alley's cuisine may be outdated, but its comic-noir atmosphere and live piano bar are still hard to beat. 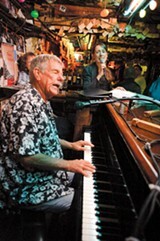 Rod Dibble tickles the ivories. Hours: Sun.-Mon. 6 p.m.-1 a.m.; Tue.-Sat. 5 p.m.-2 a.m. There are all sorts of reasons for going out to dinner that have nothing to do with the nutritional, and the Alley has been offering its patrons at least three good excuses for stopping in since it first opened its swinging doors eight decades ago this year. The place belongs to an era when saloons had themes: fronded tiki, dormered Old English, stein-and-lederhosen Alpine, red-damask Shanghai. The Alley's gimmick, as you might guess, is urban alleyway, a sort of comic-noir milieu where the dim dark is undercut by green-shamrock Christmas lights and the most dangerous prospect is too much vermouth in your martini. It shares a teeming block of the Grand Lake neighborhood with several Asian restaurants, Walden Pond Books, Charlie Hallowell's new Boot & Shoe Service, a chocolatier, a diner or two, the grandiloquent Grand Lake Theater, and two nearly-as-venerable saloons — raucous, blue-collar Smitty's and the dazzlingly red-plush Kingman's Lucky Lounge. The Alley sits smack in the middle of this light-strung/art deco/Spanish Colonial setting, a shack-like frontage in shutters and clapboard with neon sign and cartoon arched-back alley cats a-beckoning. Inside is a dark, low-slung warren of booths and alcoves made up of Formica tables, red leather benches, and what appears to be dilapidated old wooden fencing. Worn-wood walls are limned with ancient, hand-carved initials and are almost entirely plastered with cocktail umbrellas, faded snapshots, snatches of poetry, and 10,000 or so museum-worthy business cards, many dating back to when Oakland was in the 415 area code. Valentines, leprechauns, and the occasional jack-o'-lantern add a timeless, year-round quality. There are narrow passages, leering pussycats, and dark, forbidden staircases, and the whole place is laid out to make you feel like you've found yourself in some dead-end, low-rent back street a few minutes past the Witching Hour. This continues right on down to the interior rooftops, clotheslines, telephone poles, and silhouette of comely nudist behind shaded window. The bar is the ideal place to begin the evening. It's tucked under one of the shingled rooftops behind a series of low walls, giving the space a cozy, secluded feeling. Lanterns, buckets, an old chandelier, and a fake parrot dangle from the eaves. A dozen stools are lined against the polished wooden bar, a repository of carnival beads, neckties, antique dolls, and an impressive assortment of headgear. The barkeeps strike a nice balance between sweet and snarky, and it's a relaxing place to sip one of the establishment's signature low-priced, high-octane cocktails, like an excellent, unpretentious $7 martini. (The bar's list of "house specialties" makes no mention of orange bitters, elderflower liqueur, and the like.) The wine list is nothing fancy, to say the least, but it covers all the bases and offers eleven options by the glass or bottle, all of them in the $18-$38 price range. The beer list is more impressive, with a dozen mostly top-shelf brews ranging from Poppy Jasper Amber and Dogtown Pale Ale to Guinness and Newcastle Brown. There's a selection of nuts and chips available (the Alley's sole concession to the hors d'oeuvre trade), and munching and sipping to the sounds of Nancy Wilson and Astrud Gilberto is pleasant indeed. When you're ready for supper, grab your cocktail and head to one of the darkling tables "outside." The menu is on the limited side — four kinds of steak, fried chicken, a hamburger (cheese optional), and a few side dishes — and the cuisine is best described as Mom's kitchen circa 1967. The thick oval of chopped sirloin was salty and juicy and especially satisfying with plenty of A-1 Sauce. The chicken breasts and drumsticks were straight out of the Shake 'n Bake playbook: salty and crunchy on the outside, nice and moist on the inside. And the fairly enormous New York steak was chewy in texture and not up to, say, Ruth's Chris' hallucinogenic standards, but it was perfectly satisfying, arrived at the table medium rare, as ordered, and cost $18 instead of $45. Each entrée came with four sides. The salad (iceberg lettuce, cherry tomatoes, red cabbage, and prepackaged croutons, natch) was served in a little faux-wood bowl with a choice of creamy Roquefort dressing or an eye-opening vinaigrette. The mixed vegetables were your standard carrot-zucchini-broccoli-onion assortment, nothing special. The baked potato was a tad undersized, but it came with a little paper tub of sour cream and lots of butter, and the garlic toast was crisp and not overwhelmingly garlicky. (Thick, limp french fries and sweet, crunchy onion rings are available as well.) Please note that the Alley is remarkably vegetarian-friendly for an uber-retro steak house: The salad, french fries, onion rings, baked potato, garlic bread, and mixed vegetables are available on an à la carte basis, or you can get a vegetarian plate (salad, veggies, garlic bread, and baked potato) for just $9.50. The Alley's greatest attraction, though, isn't the food or the cocktails or even the goofy Dashiell Hammett-in-Disneyland décor. It's Rod Dibble, the man behind the big piano at the end of the bar. Dibble's been the Alley's cocktail pianist for half a century (a milestone surely worthy of municipal proclamation), and in those five decades he's accumulated a repertoire of some 4,000 songs, most of them from the heyday of Cole Porter, Irving Berlin, Johnny Mercer, and the Gershwin boys. The sprawling piano bar — his office — is equipped with stools, songbooks, and a microphone, and everyone's invited to settle in with a drink; request a show tune, torch song, or Tin Pan Alley novelty number; and let loose with the vocal. Dibble is adept at nursing the inexperienced through unforeseen key changes, erratic tempi, and other landmines, but the general level of musicianship is high (various jazz instrumentalists and the Oakland-East Bay Gay Men's Chorus have sat in from time to time), and the pianist creates a relaxed, friendly atmosphere five nights a week. Drinks, ambience, dinner, and a show for under twenty bucks: May the Alley and its cats endure for another eighty years.